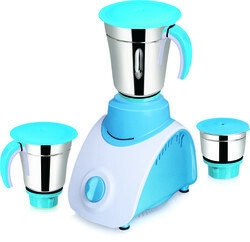 Prominent & Leading Manufacturer from Mumbai, we offer 550 watt 3 jar mixer grinder. We are one of the trusted names to offer 550 Watt Three Jar Mixer Grinder for our valued clients. These are widely used to prepare quality thick juices easily and quickly. Moreover, our range also solves all purposes of kitchen as it comes with two jars to grind all kinds of fruits and vegetables. Offered range of products is highly appreciated and demanded by our clients.